Don’t be shocked if you get less points when flying on Delta “glitch” tickets! For a while now Delta has been paying out less Skymiles and MQMs for so called “discounter” fares. These are lower priced tickets than you and I have access to. Cruise lines, for example, have to fly employees home all over the world and get much better deals from Delta. But, as you can see from the screen shot above, they also, as of late, have been rewarding those who fly with less points in their personal account. All part of only reward those who spend the most with Delta. Now on to yesterday’s tickets. Clearly the “mess” (from Delta’s viewpoint) was not published fares. What does that mean for those who are flying on these tickets, that is those of us who actually got a ticket issued not just a PNR that later was canceled when no ticket number was ultimately issued (txs for link DJ Noah). Will we get full points for these tickets? First off I don’t care if I get one single point. The price was so good that I will be happy to pay that price all day long and never get a single Skymile or MQM. But I chatted a bit with readers on FlyerTalk and reader “Dlroads” feels Delta will pay out points based on the “Earn Miles with Special Fares” and I tend to agree. Maybe. There were a bunch of dynamics going on for these brief two hours. Some were able to book on Delta.com. It could be argued these were NOT a special fare and Delta has directly told me again and again that if it is bookable on Delta.com then it will earn FULL Skymiles and MQMs. They have said you and I can NOT book these kind of discounter fares. They have said that travel agents or tickets that are part of say a cruise and fly package certainly could be one of these consolidator fares. So I think those who got tickets on Delta.com will get points like any other ticket. But what about those who started at Travelocity, Orbitz and other sites? Most times, that is every other day of the week, these sites will and do qualify for full credit. What about this time? I would not be surprised at all if Delta says your ticket was a consolidator fare and you get less points. I have not confirmed this at all with Delta but I think it could happen. If it does, please, do not even think about complaining about it. You got a deal that comes up only once now and again and it may be years before it does again. How many points you get should not matter. ← The missing 15,000 Spirit Airlines miles – whose fault is it when points do not post? I have come to believe that when these errors occur that the following should happen – airlines will honour one ticket per person and no miles will be given. This will discourage the mileage running and back channel promotion of these mistakes. When people get so greedy, like those that booked more than one trip yesterday, that we all suffer as the companies need to make up the difference from the rest of their customers. @planeguy727 – the problem with the 1st part is the DOT says they MUST honor if ticketed. Most of my 2014 vacation time is already spoken for, so I didn’t take advantage of this even prospectively. I don’t like flying THAT much. That said, I think that it’s fair if airlines don’t award full points/miles on some of these mistake fares. I am surprised that United didn’t do that with their virtually free tickets the last time they made a mistake (Hard to keep track with them). Frankly, that would have been enough to get a substantial number of people to cancel their tickets, or some of them. If Delta does want to award fewer miles, then I hope Delta’s IT is incapable of figuring out how to do it and everyone gets their miles. Though, they are still Skymiles and won’t help any with MQD’s. How are you jumping to the conclusion that fares published in the GDS – remember that these were bookable via multiple OTAs and searchable in ITA – are somehow consolidator fares. That’s not how our systems work. These were published fares and will earn the normal rates. @A Consolidator – we shall see. Delta as you know can do anything they want with their awards program. They decide what is what not you or I. These tickets were booked into a specific fare class, and had fare rules associated with them. Delta publicly declared the tickets would be honored, not with an asterisk. Full miles will be earned. @Gary – I can’t wait to see what happens. I can only DREAM of what your post would look like if they choose NOT to give full miles, fare class bonus and MQMs (don’t think MQDs will really matter much at these price 😉 ) Txs much as always for your feedback and FF knowledge! I thought a lot of these booked as Y and B fares, and first/business, which even if they were “special fares” gets them full credit. @Daniel – sure but notice what deeply discounted “Special fares” pay out. I credited all of mine to Alaskan, so how will that change?! The term “No body knows,” from the Lion King just rings here doesn’t it! I flew yesterday afternoon on a flight I bought in the morning on Delta.com. All of my Skymiles and MQMs have posted, including the bonus for the first leg that was in “A” class. I doubt this will happen (earning less miles). I booked mine through an agency and they said that they were just published tickets (NOT bulk tix, etc.) so I think everyone should be good. FYI to those with PNRs but no ticket numbers: Delta Reservations can now go through and manually re-price and ticket those that were confirmed but not ticketed. Ticket numbers have already been issued for my reservations not previously ticketed. Kudos to them! @BenTraveling – that is a great data point on those direct booked. Txs. Now we will see on the rest! @Jordan – HUGE txs for this data point. Will try to get an “official” quote on this from Delta to post. HUGE! 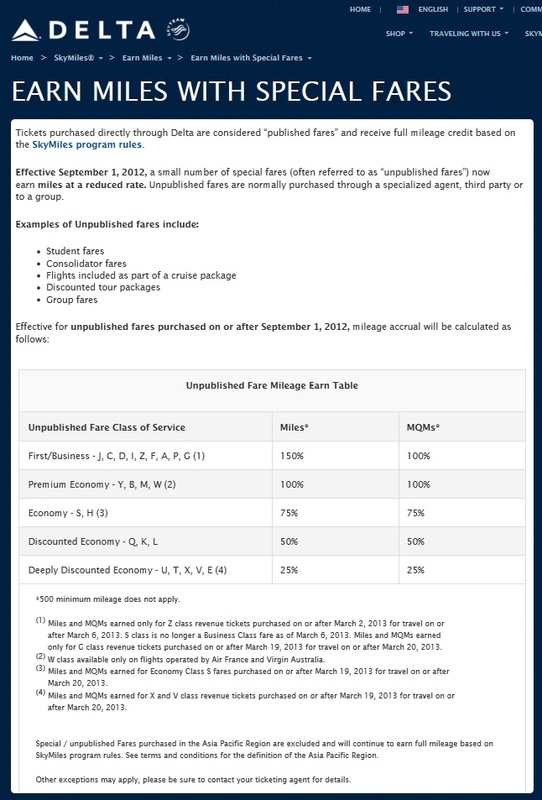 Yeah points will be paid out according to the published fare class.